Habit. It’s a dirty little 5 letter word. I read somewhere that it only takes 6 times of doing something before it becomes a habit. Habit is a close relative to addiction, although somewhat easier to change. If you’re like me, you’re a creature of habit. You like doing things the way you’ve been doing them and don’t feel very compelled to change them. That’s the way I was before I began taking control of my finances. I was a habitual spender of my paycheck. There was no saving involved. When I started this personal finance journey, I had to break that habit and begin a new one. One that involved paying off my debt and saving money. Like any other habit, it took time to really make it into a habit. Within that greater habit, there are other habits. The habit of checking balances regularly. The habit of balancing the bank accounts. The habit of keeping the budget. That last one, the habit of keeping the budget, is the one I’d like to focus on here. In the beginning (anyone else hear that choir? ), I used only a copy of Microsoft Money (now defunct). As I matured in my budgeting, I adapted a spreadsheet based on the budget spreadsheet that Dave Ramsey created for his Financial Peace University. And that’s where it’s been since. I have spreadsheets going back several years, in fact. So, you can see, 6 weeks of undone budget work was quite a pile of work. And like any good person with lazy tendencies, I put it off. Before I knew it, there was almost 3 months worth of budget to do. That was about the time that I decided that maybe my habit needed a bit of rethinking. I began looking into new personal finance software that might integrate a little bit better. What I decided on was You Need A Budget. I’ll have a review of that coming up in the next week or so. Telling all of you that was just getting us to this point. The meat of the idea. You’re doing it wrong! Somewhere, something your doing is being done wrong. Maybe not wrong in the sense that it’s incorrect (none of us make financial mistakes right? ), but wrong in the sense that the processes that you are using are costing you; Time or money, or both. If there’s one thing I’ve learned through all of this, it is that you must be vigilant. You’ve got to rethink your processes periodically. It doesn’t have to be all that often; Some will go overboard and spend so much time rethinking their processes, that they’ll suffer from analysis paralysis. Instead, set up a schedule where by you set aside an hour or two to go through your processes and try and discover new ways of performing those processes that might save you money or time. In our case, moving to a newer software that made it easy to import our transactions and had the budget part of it all built in has resulted in saving us a lot of time. What about you? What processes do you perform that you’ve never changed? Take a look at them and see if you can’t find a way to save yourself some time or money! Several things have happened recently that have made me decide that it’s time to upgrade the way I track my finances. First, the software I currently use (Microsoft Money 2006) is no longer supported. At some point it’s not going to work anymore. Not for a while, but that combined with other factors says it needs to be replaced. 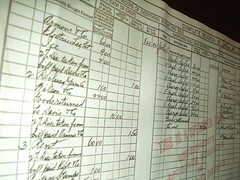 Second, currently we track our check register in Money and then transfer the info into a spreadsheet for our budget. It’s somewhat archaic. Finally, it’s cumbersome and time consuming. I’d like something that is all-in-one and that I can enter my register stuff in while categorizing it on the fly and that I can then click over and see the effect on budget and so on. The software that I’m currently looking at and will likely demo is YNAB (You Need a Budget), MoneyDance, and Quicken. I’ve looked briefly at GNUCash and I’ve used Quickbooks before, but both are pretty heavy duty accounting software and the object here is to simplify, not have to learn proper double entry accounting procedures. So far, the front-runner is YNAB. But, I haven’t tested any of them yet so I only have the online sites to go off of. Which brings me to the online options. I think they are out. Some are very robust, but none of them will automatically bring in my information, and I have no need for access to it from anywhere, so it just seems like an added privacy risk that I don’t need to take. Now, here’s where all you readers come in. I want to know what you use. What do you recommend? And what options/features have you found to be “can’t live without” in your software.